James Hill-Seekings (stripes), pictured playing for Peterborough Northern Star earlier this season, scored a hat-trick for Yaxley against On Chenecks. Yaxley and Wisbech Town warmed up for Monday’s (May 1) United Counties League Cup Final in splendid style. Both won their final Premier Division matches today (April 29) 5-0 and for Yaxley that means a third-place finish, the highest in the club’s history. Dan Cotton scored for Yaxley against ON Chenecks. The Cuckoos hammered ON Chenecks at In2itive Park with young James Hill-Seekings grabbing his first top-flight hat-trick. Joe Butterworth and top scorer Dan Cotton also found the target. Wisbech scorers at lowly Harrowby United were Adam Millson (2), Jon Fairweather, Sam Murphy and goalkeeper Sam Vince who converted another penalty. The teams meet in the cup final at Peterborough Sports’ PSL ground on Monday (3pm kick-off). Wisbech have finished sixth in the Premier Division. Holbeach United’s 2-1 home defeat to Wellingborough Town meant a seventh-place finish, while Peterborough Northern Star have finished 15th after a comfortable 2-0 win at Kirby Muxloe today. Josh Moreman (right) scored twice for Peterborough Sports at Newport Pagnell. Sports' boss Jimmy Dean is in the background. Wilkins Makate’s thunderbolt fired Star ahead in first-half added time before Jake Mason claimed the second goal after the break. Champions Peterborough Sports finished their fantastic season on 112 points from 42 matches, 36 of which were won. 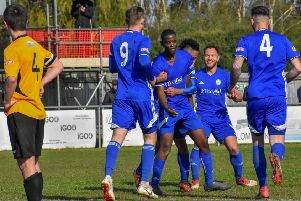 They lost just twice and finished with a goal difference of plus 116 after avenging their FA Vase defeat at Newport Pagnell today. They even survived a late playing cameo form manager Jimmy Dean this afternoon. Sports won 4-2 thanks to goals from Josh Moreman (2), Dan Bucciero and Avelino Vieira. Sports seek to complete a league and cup double on Tuesday (May 2) when tackling Deeping Rangers in the final of the Hinchingbrooke Cup at Yaxley FC’s In2itive Park. UCL Premier Division runners-up Deeping drew 0-0 at Boston Town today in their final league match.